Beale Street in Memphis. Photos by Eric Lindberg. I’d wanted to visit Memphis from the moment I heard Paul Simon sing about it in “Graceland.” Memphis is mentioned in the lyrics of more songs than any other city, including Paris. He’d been recording all day, but owner/sound engineer Sam Phillips wasn’t getting the sound he wanted. Around midnight, when Phillips was about to give up, the unknown Elvis sang “That’s All Right” the way no one ever had -- and the rest is history. On the wall was a huge blown-up photo of The Million Dollar Quartet: Elvis Presley, Jerry Lee Lewis, Carl Perkins and Johnny Cash. On the night of December 4th, 1956, Perkins, who had recorded his hit “Blue Suede Shoes” at Sun Studio, came to record some new material. Deciding to continue on the trail of Elvis, I headed off to lunch at Arcade, the oldest soda fountain in Memphis, and one of Elvis’s favorites. He’d sit in the back booth near a mirror so he could see if he was spotted; if so, he’d sneak out through the back door. Naturally, I had to try Elvis’ favorite dish, a fried peanut butter and banana sandwich – lip-smacking good. 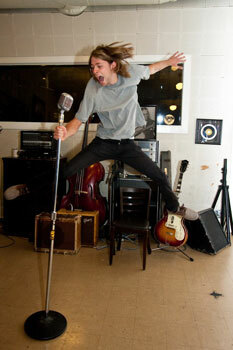 A visitor to Sun Studios. Next stop: the Smithsonian Rock ‘n Soul Museum where I was dazzled listening to more than 100 old songs, looking at antique musical instruments, radios, and jukeboxes. I loved the outrageous and flamboyant sequined costumes of Elvis, Otis Redding. B.B. King, Al Green, and Isaac Hayes. I gaped in astonishment at solid diamond watches shaped like pianos, enormous heavy gold medallions, belt buckles the size of desert plates, and full length mink coats for men. Today’s rappers have nothing on these guys. 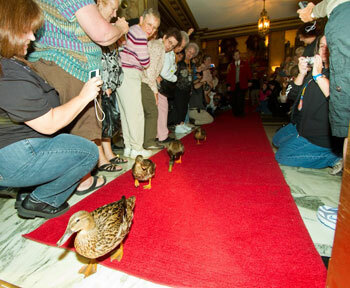 A little before 5 pm, I headed over to the Peabody Hotel for the “Duck March.” Back in 1933, the Peabody General manager and a friend were hunting in Arkansas, returned to the hotel drunk, and placed some live duck decoys in the Peabody fountain. The guests loved it so much, that ducks in the fountain have been a tradition ever since, along with the famous duck parade. It was time for dinner. 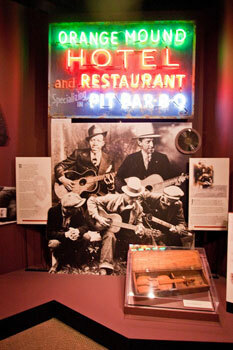 Memphis is the pork barbeque capital of the world with more than 100 barbeque specialty restaurants. One of them, Rendezvous, uses the slogan, “Not since Adam has a rib been this famous.” The restaurant has been a Memphis landmark since 1948, and every Saturday night, a good 1,000 people sink their teeth into giant slabs of ribs. I started with their famous cheese and barbeque pork nachos (which would have been enough food), but I then pigged out on their Charcoal Broiled Pork Ribs. Now that I’d overfed my stomach, it was time to feed my soul. 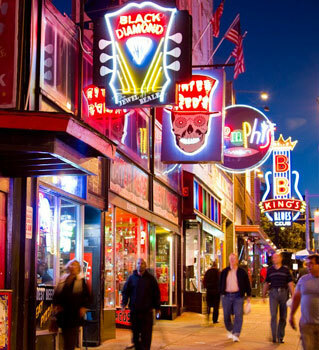 It was on to famous Beale Street, a kaleidoscope of neon lights, restaurants plus rock ‘n roll, blues, and jazz blaring from every doorway, and public park. Everywhere musicians walked the street carrying guitars or cases of harmonicas or tambourines, waiting for a chance to jam. I didn’t know which of the 25 clubs to choose, so I went music hopping -- door-to-door -- and had my pick of feet-tapping hand-clapping soul, rock, and funk. It was late when I arrived back at the Mississippi River-facing River Inn in Harbour Town on Mud Island, five minutes away from downtown. My room had a four-poster bed with Frette Linens and for turndown, they’d left me a glass of port and two truffles. The next morning I went to the River Inn Restaurant for a breakfast feast of eggs, pancakes, fresh fruit and yogurt – all included in the price of the room. Graceland is the second most-visited residence in the United States, and even though I dislike glitz, how could I not go, especially as I still listen to Paul Simon’s “Graceland” on my Ipod? 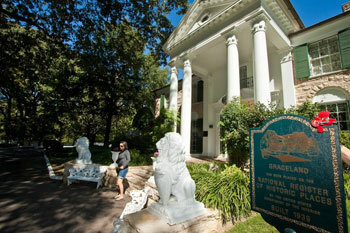 I joined the throngs and shuffled through rooms with the “King’s” costumes encased in glass, the Hall of Gold with 110 of his gold, platinum and multi-platinum albums and singles; the legendary Jungle Room where Elvis was known to cavort with women, and the Meditation Garden where Elvis, his parents and twin brother Jesse (who died at birth), are buried. I boarded Elvis’s two custom jets with gold-plated seatbelts, 24-karat gold-flecked sinks, and a full Queen-sized bed in the rear of the plane (also with gold seatbelts). I learned that the three-year-old Lisa Marie had never seen snow, so Elvis bundled her up and had his pilot fly to Colorado. They landed, Lisa Marie played in the snow for ten minutes, and then they flew back to Memphis. My last stop was the Car Museum with his 33 cars and motorcycles including the famous Pink Cadillac. Talk about southern hospitality – I wanted to take the Main Street Trolley to an even more important king than Elvis: Dr. Martin Luther King, Jr. and the National Civil Rights Museum housed in the Lorraine Motel where Dr. King was shot. 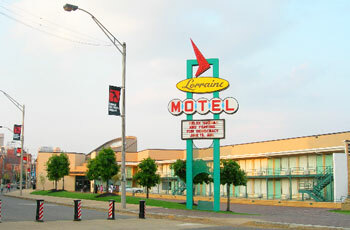 The Lorraine Motel where Dr. King was shot is now the home of the National Civil Rights Museum. I boarded the vintage trolley, completely restored, which costs a dollar a ride. I found out you need exact change and I didn’t have it, but the driver smiled and told me to get on anyway. There were only two others on the trolley, and the driver entertained us with funny stories all the way to the museum. The mood was more somber when I looked at the exhibits of the civil rights movement. There was movie footage of the lunch-counter sit-ins, Rosa Parks, the Montgomery bus boycott, and the Memphis sanitation strike. I could feel my stomach turn as I moved from room to room and saw man’s inhumanity to man. They’ve reconstructed the motel room where King was staying just before he went out onto the balcony and was gunned down. The ashtray full of squashed cigarette butts and the half-filled coffee cups are eerie. As I was leaving the foyer, I noticed a 14-foot high 21-foot wide sculpture by Texas artist Michael Pavlosky entitled, “Movement to Overcome.” Into a huge chunk of blackened bronze rock, the artist has sculpted hundreds of figures walking up a mountain, moving on across time and boundaries. For the artist, these are the untold stories of people who lived and are living the Civil Rights movement. It had been a long but enriching day. 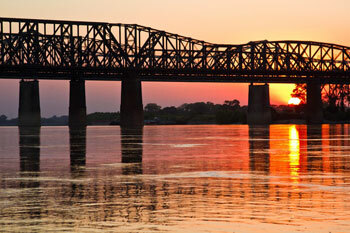 I drove back to my hotel and strolled down the pathway in Tom Lee Park along the Mississippi River. The sun was sinking into the river. A few runners passed, some giggling children skipped by, then a couple walked by, holding hands. I pulled out my harmonica and played a blues riff, hoping I could hold the sun on the horizon just a little longer. The Smithsonian Rock 'n' Soul Museum. Duck March daily at 11:00am and 5:00pm.